This article is about the collectable minifigure. For other uses of the term, see Elf (disambiguation). 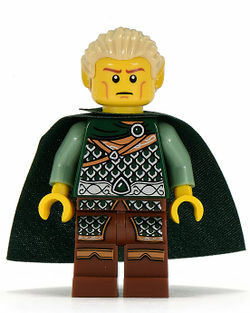 The Elf is a Collectable Minifigure released in 2011 from 8803 Minifigures Series 3. He comes with a shield, a cape, and a bow and arrow. He also comes with a newly moulded hairpiece which also appeared in Series 4 on the Werewolf in brown. The Elf was one of five minifigures chosen for a re-release within the set 850458 VIP Top 5 Boxed Minifigures. The Elf comes with a new slick-back hair piece. It is a tan colour with on each side yellow ears. His face features a stern expression with the general colour of the head being yellow. He also comes with a dark green cape. His torso is coloured earth green with a armour printing on it. The arms are a lighter green. His legs are also earth green with the same armour printing as his torso. The Elf also comes with a bow and arrow and also a new sheild piece. Printed on the shield is an elk. The Elf like other collectable minifigures comes with a black display stand. A 2007 LEGO Club Magazine shows a picture of an Elf warrior from the elf lands on a Castle map. Despite the rumours, the elves were never produced. Also, in his description, it says that the elven kingdom is north of the Western Kingdom. In the magazine, the Crown Kingdom was to the west, and the elves were north of them. It hints Trolls in his bio, too. He doesn't come with a quiver due to the fact that he is already wearing a cape. He was the Collectable Minifigures icon on the LEGO.com website. He looks similar to Legolas Greenleaf from The Lord of The Rings theme.